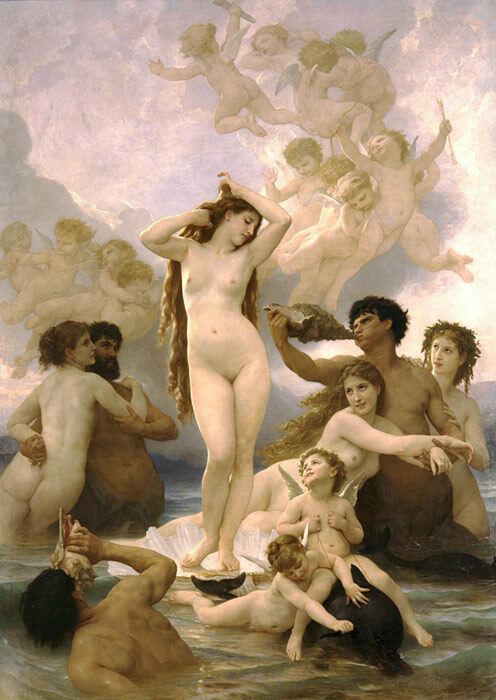 In Naissance de Venus [Birth of Venus], Venus, known as the bringer of joy, Roman goddess of love and beauty stands on a shell in the middle of the ocean, surrounded by admirers. Two mermen use conch shells to trumpet her arrival as the angels that came to witness her birth ascend to heaven. This painting is truly a tour de force for Bouguereau, standing just over 9’ 10” high, and just under 7’2” wide. Birth of Venus contains 22 fully worked out figures all of which come together to form an amazing composition. Bouguereau uses the goddess, Venus, as an exemplar of the Beauty in our lives. Bouguereau’s Birth of Venus holds a strong resemblance to Botticelli’s Birth of Venus, which also depicts Venus with long flowing hair standing on a similar shell. SPECIAL NOTE : The painter will make the reproduction as close to the original oil painting as possible. If you want your painting to alter from this likeness, please email us and " Naissance de Venus [Birth of Venus], 1879 " will be reproduced according to your special requirements.